2018 was a great year, full of firsts and big wins for Almon Inc.’s Training and Animation Facility (TAF) and Training Development Center (TDC). From quality of life to new and interesting projects, we are excited about everything we have accomplished. We really stepped up our game in 2018, quite literally, in fact. We didn’t know it at first, but Almon loves ping-pong! Our first table was donated to us in August. 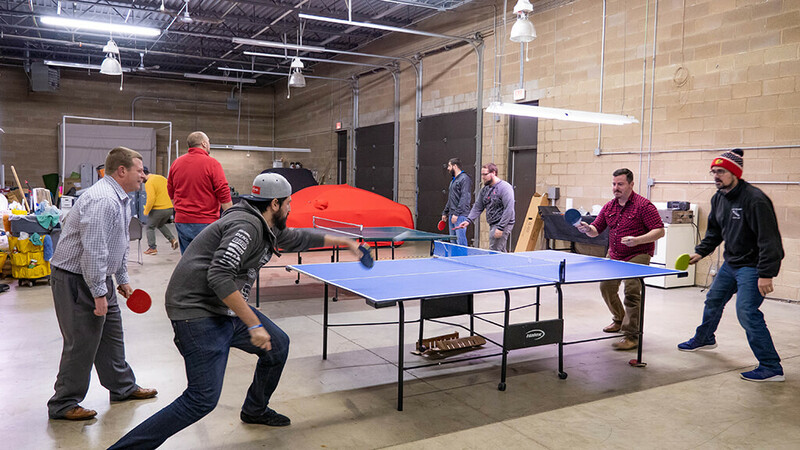 We started playing singles, then doubles, then we received a second ping-pong table to accommodate all the players. On any given break you may see eight of us in the shop duking it out with our own personal paddles! A full set of eight on the ping-pong tables. Besides ping-pong, the jingle of dog tags has been a welcomed sound the past few months. Chris Montoure has been bringing in his pup Charlie. 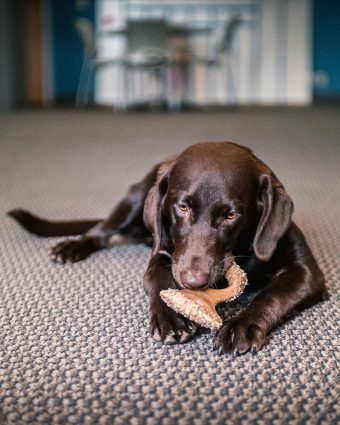 She has become our office dog, and we all light up every time she comes to visit. We have also done some major upgrades to the TAF office this year. After creating a committee to develop the scheme, we have finally repainted our office! We now sport proud Almon colors throughout. It is a much better look than the dijon-mustard yellow and dried-up maroon that previously graced our walls. All of the painting was masterfully done by our very own TAF volunteers. 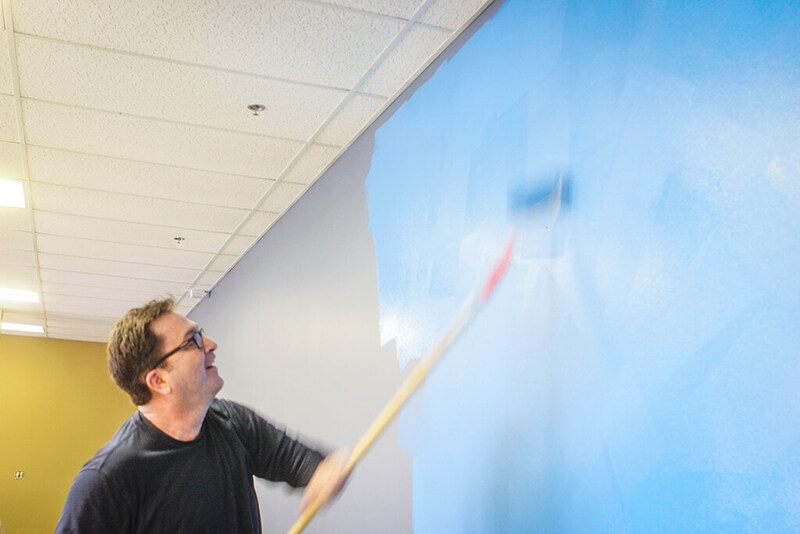 Along with the painting, we recently expanded our workspaces, and we are ready to add more. 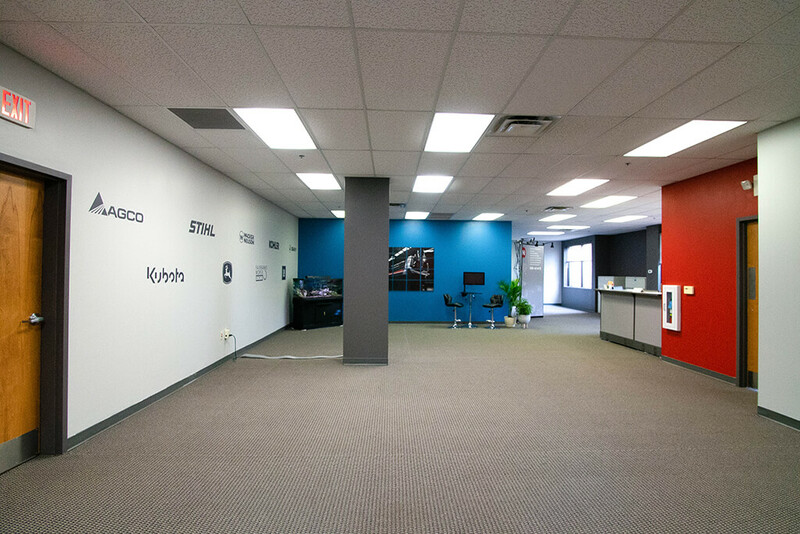 The freshly remodeled west wing at TAF. Ken Hill having maybe too much fun painting. The Instructor Led Training (ILT) group at TDC has become an important part of our TAF family. 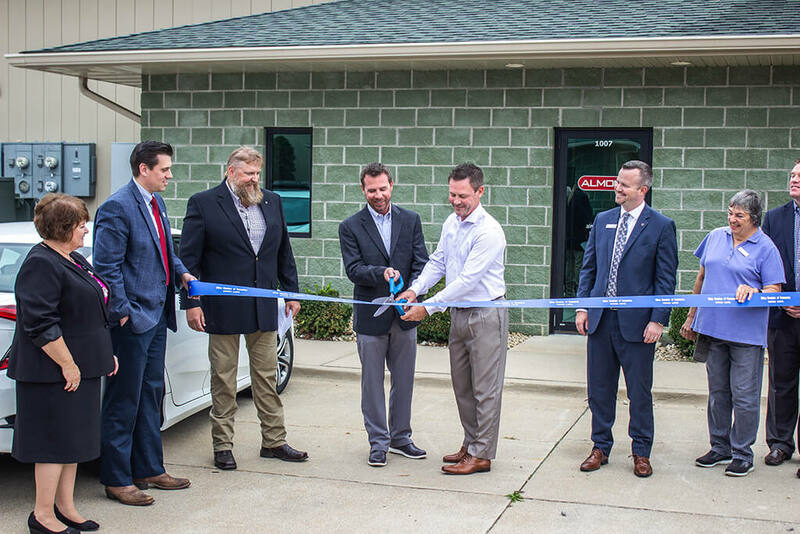 They have recently moved from their old office in East Moline, IL, to a first-rate new facility in Milan, IL. The office still has that new-car-smell and even dons Almon colors just like TAF. Check out the unveiling video for the inside scoop. Grand opening of the new TDC facility in Milan, IL. Outside the office, we had a fun opportunity with a strong client of ours, STIHL®. They invited us to attend the 2018 STIHL TIMBERSPORTS® competition at Milwaukee’s German Fest. Beyond being a great time, our guest media passes let us get up-close and personal with the athletes and competition. Our visual media crew was able to get some great photos and footage to help promote our relationship with STIHL®. 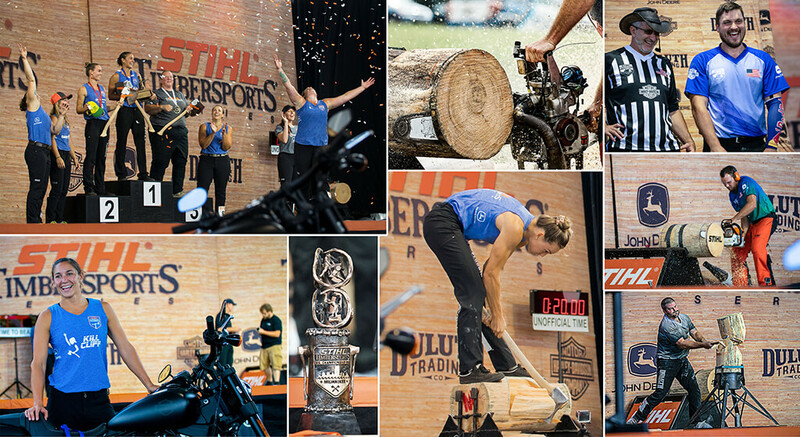 Photos of the athletes at the STIHL TIMBERSPORTS® competition taken by our Visual Media team. 2018 saw an overhaul of our website. We went in and reduced where needed and beefed up the rest to provide a more streamlined experience. Another part of the streamlining was transitioning to Amazon Web Services, which gives us more control and peace of mind. Along with these updates, we have enhanced our Search Engine Optimization(SEO), which has more than doubling our website traffic. 2018 saw a long list of successful projects and new opportunities. From a brand new industry to a “Built Ford Tough” inspired commercial, each department has a lot to be proud of. One of our high-points this year involved a number of our departments at TAF. A leading chainsaw and power tool company came to us looking for an all-in-one mobile application for their entire line of products. This began a cross-pollination to create the best app development team. After locking ourselves in a room for about a month, we developed a top-tier solution and the client loved it. This led to an important face-to-face meeting with our team, the client, and other involved parties. This made creating an accurate estimate and planning for future resources easier. More importantly this helped us create a connection with everyone we will be working with in the future. We are really looking forward to making this opportunity a reality in 2019. 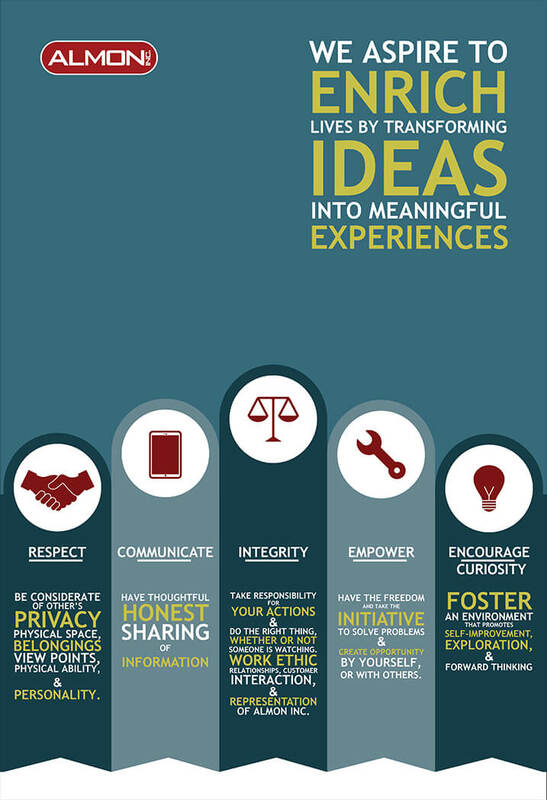 Our TAF and TDC values poster. Our ILT department has expanded along with their new building. We recently hired Sam Salmon and Cliff Sack as Curriculum Developers. Both have transferred from our Training Information Authoring Center (TIAC) in East Moline, IL. Kubota is a great client and they recently challenged our team with a diagnostic training deliverable. We intended to solve this problem by creating a benchmark diagnostic training class using a seven-step diagnostic process. This process is now the standard and framework for all products and continuing-education classes for Kubota. They also needed a comprehensive two-day ILT for three of their major national accounts in the rental/fleet industry. We had a tight turnaround of six weeks to complete the training course and the first class successfully started December 3rd. Herman Gould in Hawaii to teach the Almon Electrical ILT course. Speaking of the rental/fleet industry, we have done a lot of work with Sunbelt rentals this yearas their ILT provider in the United States. Our instructors have traveled all across the country delivering our Almon Electrical Methods & Techniques ILT course. We have even delivered it in Hawaii! 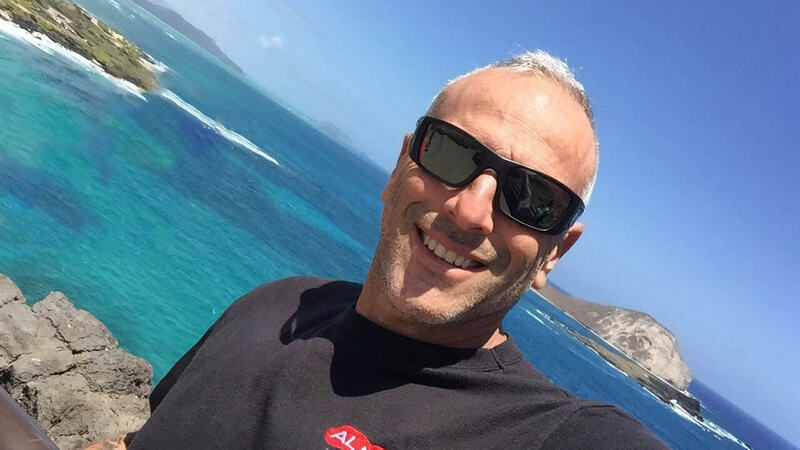 Take a look at our blog, Aloha from Almon Inc., for the full story. We also made some great additions to our ISD department this year. 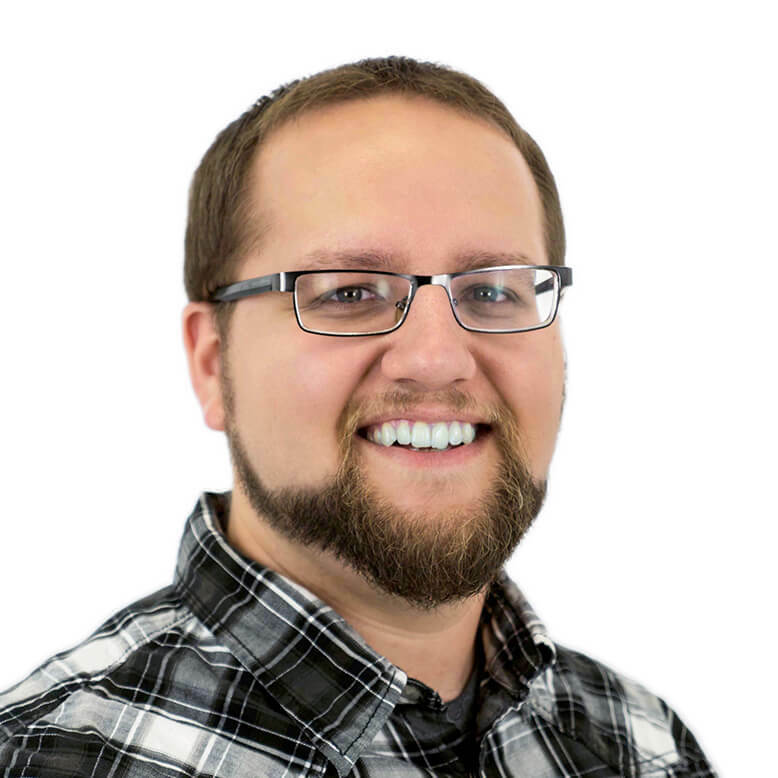 We needed to expand our office capabilities for the addition of Instructional Designer Mike Dahle and Content Developer Brian Meyer. Their expertise has helped us bring a more conversational and inclusive tone to our eLearning deliverables. We are breaking the mold on the traditional PowerPoint learning modules to create more compelling learning solutions. We are now able to add more educational aspects to training both internally and externally. By applying an education-based model, we are identifying needs and wants to classify objectives for the best outcome. We can run assessments up-front to gauge the standard of the user and build a course around the objectives needed to raise the user to the required level. All the additions we have made to ISD have upgraded our deliverables and our process overall, allowing us to increase the industries we serve. TAF Multimedia and ISD teams. 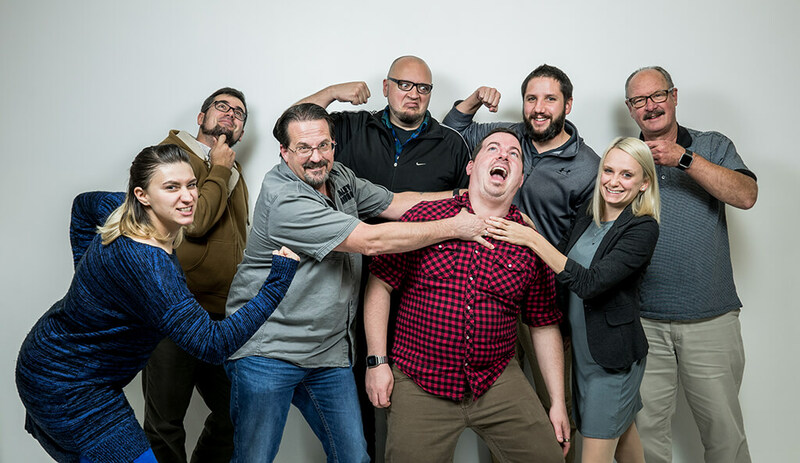 From left to right: Brittney Cotter, Mike Dahle, Jeff Ziemendorf, Louis Troutman, Brian Meyer, Joe Kerznar, Kora Dimmick, and Paul Sinklair. Our retro style avatar created by Louis Troutman. Joe Kerzner has advanced to the lead of the Multimedia team and is doing a bang-up job. Multimedia Designers Brittney Cotter and Kora Dimmick have both joined the team this year. I knew Brittney from my years in college and knew she would be a great addition. Each of the designers house their own unique abilities and we have been leveraging them as much as possible. 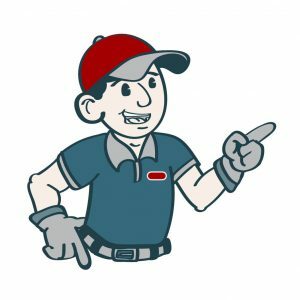 Character assets, like a retro styled avatar, are being incorporated into our courses and are able to be branded to the customers liking! Multimedia works closely with our members at TDC holding biweekly meetings to share processes, design ideas, and inspirations. Many new connections and fruitful concepts have spawned from this process creating a strong relationship between TDC and TAF. Our Off the Shelf (OTS) eLearning course program has been a hit with our clients providing them with a prepackaged solution to their needs. We have begun looking at redesigning these courses to hold the same look and feel we have brought into Almon’s culture. The updated look further expands our approach to new and fresh eLearning. We have a new addition to the programming group this year. 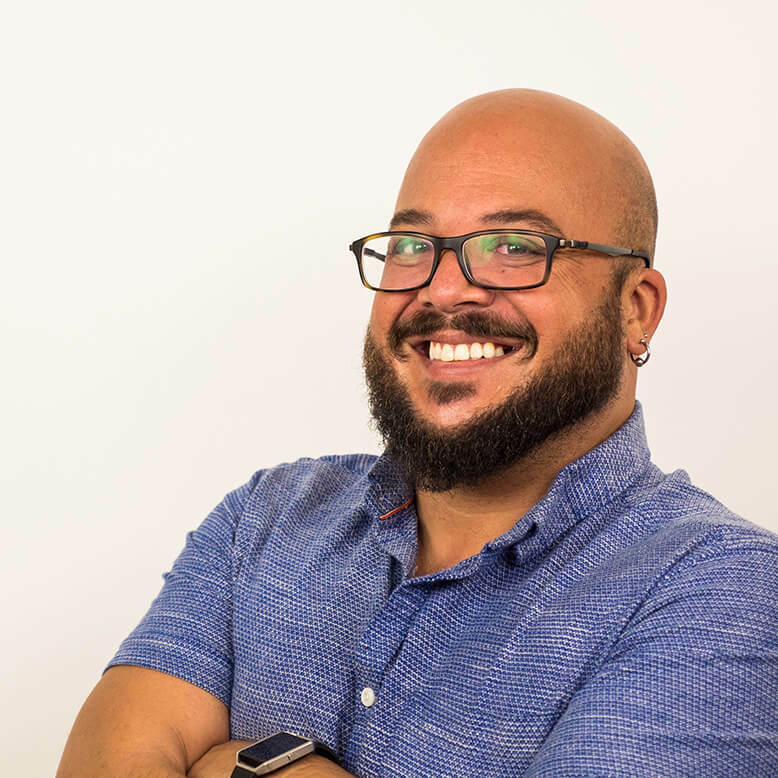 Devon Devoss has joined us as a software developer. 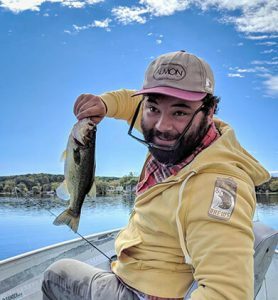 Devon Devoss has become my fishing buddy during the summer months! 2018 marked the second release of the widely used STIHL Service App. If you have been to a STIHL® dealer, you’ve most likely seen a service tech using the app we built. The 2.0 release saw some app enhancements and the addition of their battery-operated product line. As always we are improving our core set of deliverables, such as interactive schematics and component-identification applications. To keep track of all these changes, we have moved to Git for version control. This allows us to roll-back to a previous version if need be. We are looking forward to the projects on the horizon to show off our new skills and talents. Almon exhibited at the Association for Talent Development International Conference in April. Even A broken TV monitor couldn’t stop us from having a great show. We connected with new customers and got up-to-speed on the latest trends and solutions for designing and delivering training. We were lucky enough to attend the Association of Equipment Manufacturers’ (AEM) Annual Conference at the Terranea Resort in Palos Verdes, CA., in November. The sessions were incredible. There is so much innovation happening as Artificial Intelligence (AI), Internet of Things (IoT), Augmented Reality (A/R) and Virtual Reality (V/R), Telematics, and Autonomous Vehicles converge and shape our industry. Technical content, video, animation, training and custom development are all crossing paths as OEM’s require robust yet simple deliverables for their customers. After completing a successful ILT project for another leader in agricultural equipment, Account Executive Audrey Majeski pitched a companion eLearning course. We identified a gap where employees still needed machine familiarization even when our ILT class was unavailable. The pitch was accepted, and now these classes have set the stage for a line of Farming 101 eLearning courses. Audrey also welcomed another addition to her family this year. On October 17th she gave birth to her baby boy, Jaxson. Cliff Anderson next to our STIHL® app at the Sunbelt Rentals National Sales event. Once a year Sunbelt Rentals holds their National Sales Event. Professionals in construction, lawn and garden, power, and many other industries look forward to gathering together, learning, and networking under one roof. We conducted live demonstrations of our instructor-led training, offered by Almon and used by Sunbelt Rentals. We demonstrated the same ATech hardware we use in our training sessions and discussed and presented our many other services, such as technical publications, animation, and video production. Our sales team also spoke to how we could solve unique technical challenges with portable virtual reality solutions. 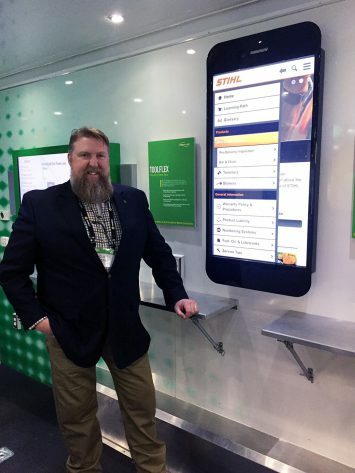 One of the most exciting things to happen at the show was meeting up with our friends at STIHL® who had an amazing display of the STIHL® training app we created for them on a giant iPhone for all to use. It was amazing to see and use in person! In October, we hosted our Almon Inc. & ICD Translation Seminar. More than 40 of our peers attended, including AGCO, CNH, Gehl-Manitou, Komatsu, and Harley Davidson. We talked about the challenges facing manufacturers and documentation teams and how they can best be solved. Kit Brown-Hoekstra was our keynote speaker and gave an excellent presentation titled Content in the Age of Machines: Incorporating Controlled Language into Your Content Strategy. Our own Animator and Social Media Account Manager Keith Kamikawa also presented on Visual Media Crossing Paths with Technical Publications. He’ll be taking this talk on the road in May to STC 2019 Technical Communication Summit Conference & Expo in Denver, Colorado. As a third pillar to the conference we had an industry Q&A round table which was a great success. It was educational and fun to have honest and productive conversations with our peers in our field. 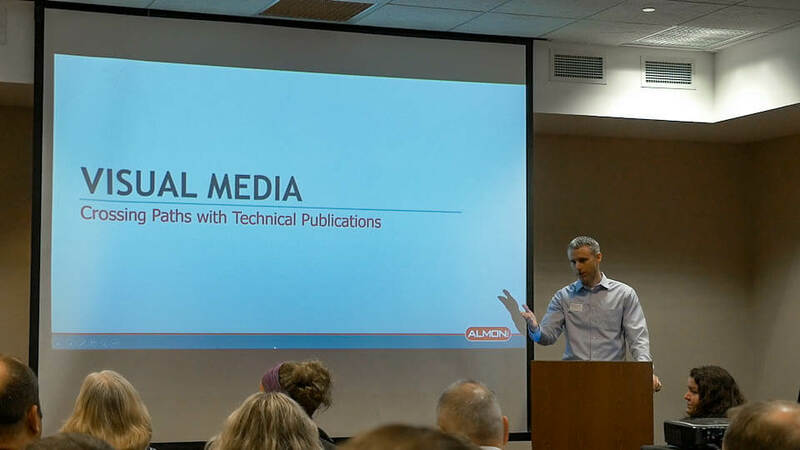 Sales Director Tim Milbrath speaking at the Almon Inc. & ICD Translation Seminar. We have made some really cool projects in our Visual Media department. We started the year with a big one. 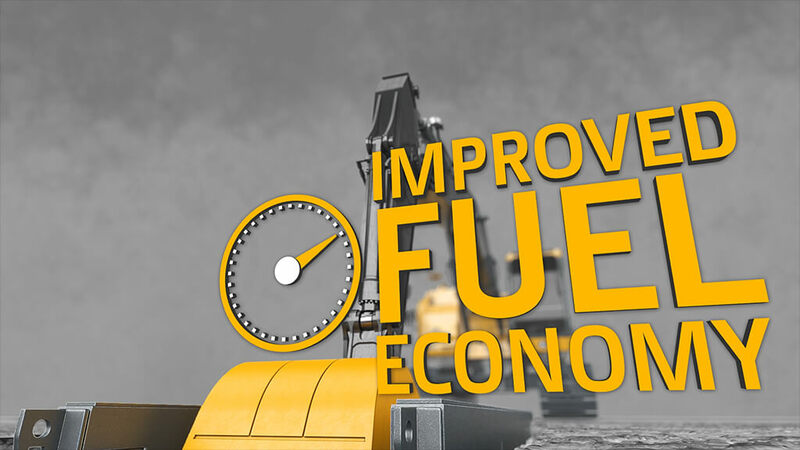 A global leader in agriculture equipment came to us looking for a marketing animation to show off the capabilities of their new excavator. We first came to the client with a mood board showing the look and feel that we wanted to create. It turns out that they loved the “rugged and bold” style just as much as we did. We have always been looking for the opportunity to create an animation in this style and we finally got our chance. The final deliverable was a great success, showcasing our skills in the marketing realm. Screenshot from our “rugged and bold” styled animation. Another leading chainsaw and power-tool company came to us looking for an engaging and interactive way of simulating a repair diagnostic. We provided a drag-and-drop interactive animation where each action became a part of the knowledge check. A points system and final rewards kept the animation fun through gamification. We were really proud of the final deliverable as it can be a benchmark for gamified simulations in our future. We took a trip down to Joliet, IL, to shoot some training videos for Volvo Trucks. This project was the result of the great work our ISD and Multimedia departments did on a set of courses for them. We shot videos on EGR and SCR systems. Our in-house videographer did a great job, and spawned a revamp of even more Volvo training videos. Earlier in the year we did a little community outreach in Lancaster, WI., near our Dubuque, IA, office. Lancaster’s High School held a career fair and invited us to attend. I made the trip out to represent TAF. After a dead-on-arrival laptop fiasco, we got our touch-screen kiosk running, and gave the students some new options for their future. A really cool coincidence came up this year with a client in a new industry for us. Alto-Shaam, came to us looking for some product renders. Renders like these are pretty run-of-the-mill for us but this one had some history. Animator and Social Media Account Manager, Keith Kamikawa, has family ties to the company. Alto Shaam makes food industry equipment and needed chefs to test and demo this equipment around the country. 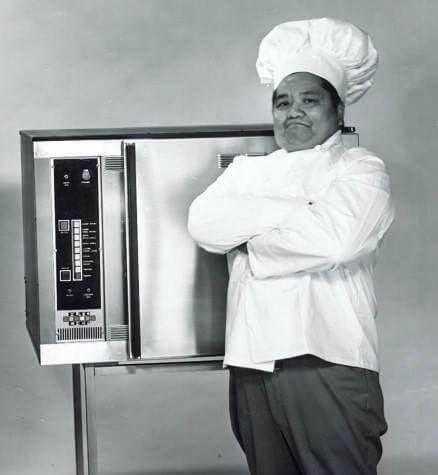 Keith’s grandpa, Paul Kamikawa, was Alto-Shaam’s executive chef for over a decade. Keith himself spent 16 years as a chef. Opportunity was seized and Keith was the animator to create the product renders for the project. It’s not every day that we find a client with a tie to Almon that goes this deep. Animator and social media account manager Keith Kamikawa. Paul Kamikawa, Keith’s grandpa and retired Executive Chef at Alto Shaam. That’s it! 2018 in a nutshell was a great year for us. We gained new opportunities and capitalized on all that we could. My favorite element was the “rugged and bold” truck style animation or the ping-pong table. They are both great in their own way! Here’s to 2019 and all the great opportunities we will be a part of! PreviousPrevious post:Incorporating Visual Media into Technical Publications, Top 5 Questions Answered!NextNext post:Behind the Scenes: What Does a Technical Writer Do?